Philodendron Xanadu are quite an attractive plant when you see them in their pots. When you put them in the ground and let them grow, they start to look and act quite a bit different. It’s then that we have to maintain them to look as attractive as they did in the pot. Philodendron Xanadu are a Philodendron, which is a genus of plants that can’t really support themselves, so they have roots to do that for them. Some are climbers while the Xanadu is more like Philodendron selloum; a shrub with a soft trunk that sends off long distance aerial roots to maintain that support. When in full sun by themselves they tend to for a dense series of trunks and will grow up to 1m x 1m. This is probably the best situation for them; planted by themselves. Maintenance then only involves once in a while cleaning out the dead leaves stuck between the trunks and the roots. will also extend out longer distances, and so will their roots. The stems will often over grow the garden edge or start to compete with neighbouring plants and affect their growth. 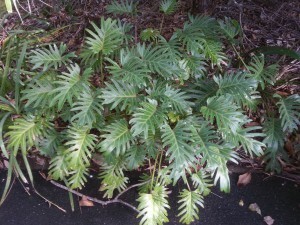 Also leaves from the Xanadus and surrounding plants will get trapped in the network of branches and roots, and if visible can be very unsightly. I have seen them used once as a lush garden edge, but when they grew larger, the leaves tended to grow over the grass edge, making it hard to maintain with the whipper snipper. The trick here is to plant them no closer than 0.7m to the edge. Recently a client looking at this situation wanted to get rid of them completely for this reason. We decided first to clean them up, and see what the result would be. First was to get rid of any stems or trunks that we didn’t want. Next was the network of roots. 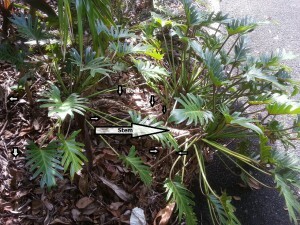 Xanadus and Philodendron selloum have an exaggerated amount of roots. The trick is to cut out as many roots as possible to leave it still supporting itself. The cut should be done flush against the stem and then chase the root to where it enters the ground and cut it off flush there. If you leave roots cut in a slovenly manner, then you are still leaving a network of plant material for leaves to get trapped in. Last trick is to pick out all the dead Xanadu leaves. The reason is they look unsightly and don’t decompose quickly, whereas other smaller leaves can easily disappear unnoticed with the mulch. Once we have completed these steps you will notice a really nice looking garden again. While the ground space is clear, you should also take advantage of the situation and mulch the area before they fill the gaps again. A handy tip for the stems that we cut off. Make sure you cut them off with at least a piece of root still attached. That way you can replant them in the garden or in a pot. Be sure to water them as well. Great advice, helped me to position and maintain my Xanadus correctly. Bits & pieces with roots that I had to remove while planting went back into the propagation area, as I’d like to have more of this great landscaping plant. 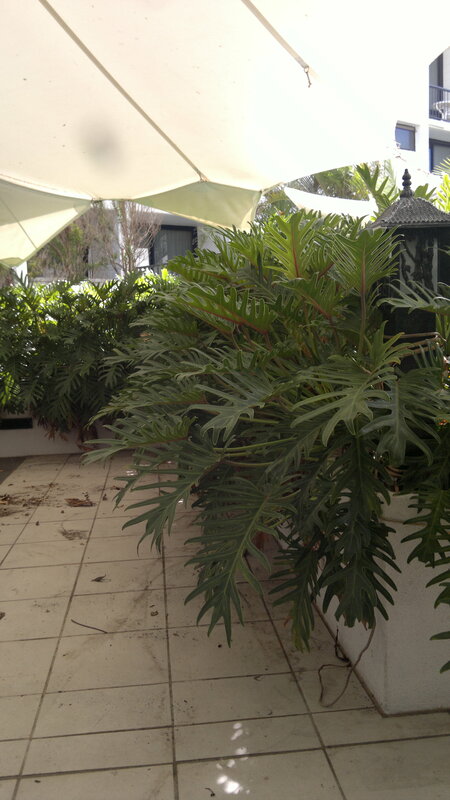 We also have a monstrous 15 year old “Philodendron whatever” at the beginning of the staircase to our verandah, which I intutively maintained the right way in the past. We were close to chopping it down, as my wife didn’t like the look, but then I went into it, pruned it a bit to shape and tidied it up. Now we both love our 2 metre high garden veteran. Thank for the hints, just keep them coming ! 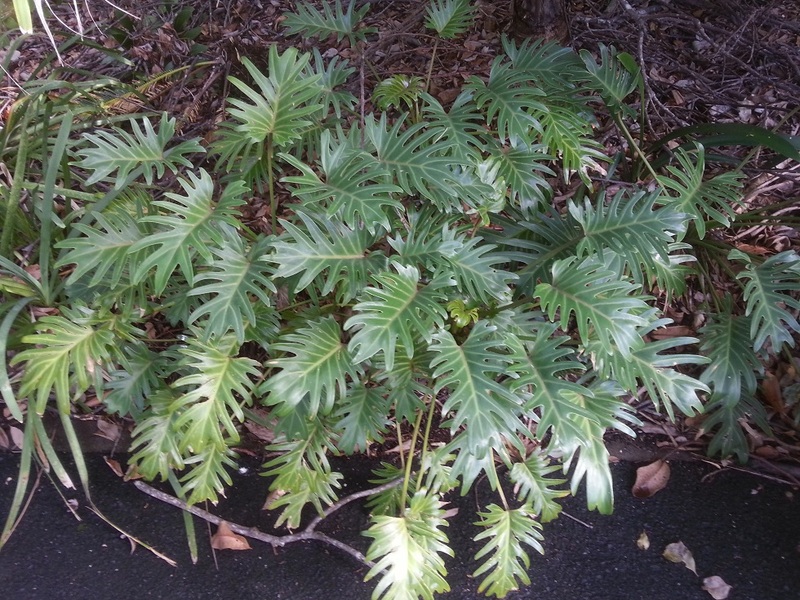 We have a Zanadu which has spread and I want to cut out a couple of branches. Can I cut a reasonable length and replant or does it need to have a root on the end of the branch. Thanks. I have just been given some of these plants, and have put them in pots. Altho watering them each day, the existing leaves are browning . Should I cut these all back for new re growth, and how low? I am the onsite manager of a townhouse comlex. There are 46 townhouses. 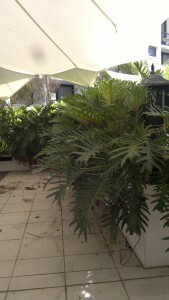 ‘Xanadus’ has been planted in all courtyards, in front of the airconditioning units! Their roots sysrem are growing through the air conditioner causing issues. I would like to have them removed completely. The courtyards are the responsibility of the tenant so the zanadus will not be maintained properly, plus it is a major job. I have large areas of Xanadus growing. One area in particular has very yellow leaves. Are they lacking in any particular nutrient? Maybe a hard prune will help! water is always a good thing. My bet is that they are up against a building under protected under some eaves. Good morning Paul. Great site! Any advice to solve ‘small’ leaves on Xanadu plants. Hi i love this Philodendron Xanadu plant in my backyard but now its getting leggy can you please suggested how to trip it and looks bushy not tall and ugly. I’m after a “dwarf” Xanadu which is much more manageable than the large one. Is this correct, or is there only one variety? Last year I planted a potted plant my mother in law didn’t want. This year, its popping up giant leaves and long stems and, it turns out to be a philodendron xandus! It has three leaves and a large system of roots. At least a foot tall soft stem. How do I take a piece off to put in a pot to bring indoors? Thank you for any help you can give! !